Technology and Social Media: Friend or Foe? My opinion on technology and social media: it’s a mixed bag! Teens reach out to us via text and email who wouldn’t have reached out otherwise, and I am so grateful for that. I also take comfort in a teen who is struggling alone with her anxiety and depression finding a forum where she can connect to others and feel less alone. But, I also see teens who don’t know how to exist without their phones (adults too, including myself). How many times do you go out to lunch and dinner and see everyone at the meal on their phone? Are we losing social skills such as eye contact, ability to sustain a face to face conversation, and how to talk to different types of people? Social niceties such as saying hello to someone on the street, or the cashier at the grocery store are being lost because we’re too busy on our phones to look up. As much as I HATED sharing a land line with my sister in high school, it did teach me about sharing, taking turns and being respectful of other’s time and needs (my sister might disagree). With everyone having their own phone, when can our teens practice that skill? I also remember having to call and talk to friend’s parents to get in touch with my friends. It wasn’t always the most comfortable for me, but I do believe it taught me manners and how to talk to adults. Same with having to take messages for my parents if they were out. This taught me to be responsible for someone other than myself, and again, developed my manners. I read an article once that Google was reducing our social networks. Where we used to reach out to Joe for his knowledge of world history, or Olivia for her knowledge of pop culture, we now reach out to Google. The information is generally accurate and quick, but now we’re losing the chance to connect with Joe or Olivia. We also are losing the ability to delay gratification. We want things now. I do believe there is something character building about having to wait in line (which I’m terrible at by the way) or for not being able to watch anything you want at any given time. Cyberbullying could be a whole post in and of itself, so I won’t go there, but I have observed the phenomena of “Facebook or social media induced depression.” Most people post their best moments on social media, not the times they’re sad, angry, or hurt, so it’s easy to assume that everyone has better lives than you do. Teens in particular are sensitive to being left out or social status, so seeing a picture of their friends together at an event they weren’t invited to can induce real feelings of despair. Same with not getting as many “likes” as their other friends do. So what can we do as parents to ensure our teens have the necessary social skills for life? 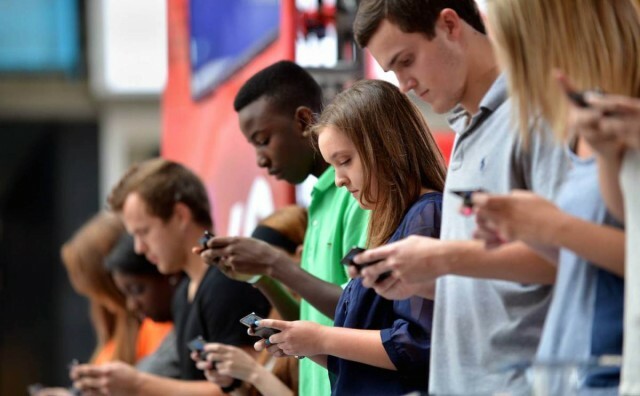 Be mindful of our own cell phone and social media use (which has been touched upon before on this blog (https://teenlineonline.org/parents/losing-the-smartphone-battle-with-your-teen-5-tips/). Our teens are always watching us and observing how we handle situations. Give them opportunities to practice social skills. Ordering in restaurants, tipping a delivery driver, calling a grandparent are all great teachable moments. Let them practice waiting in line without their phone. (You too!) You’d be amazed at the things you can find to occupy yourself or the people you may meet. Model and value kindness, even in the small moments. We spend so much time and energy worrying about or praising our kids’ academic or extracurricular achievements, that we sometimes forget about the value of kindness. Just this weekend, while taking a walk with my son, I stumbled over a branch. My son picked it up and moved it out of the way so that no one else would trip on it. That moment was worth so much more to me than his 100% on a recent test, and I made sure he knew it! Ironic for the end of this post, but we have a new Facebook page, “Teen Line Parents”, where we’ll post articles, or resources that catch our eye. “Like us” at your convenience; we won’t take it personally.